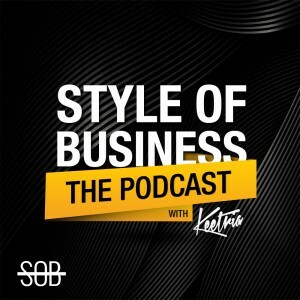 In this 46th episode of SOB: Style of Business podcast, Keetria interviews Nia Perry, the Founder and Chief Executive Officer of Gradient Global Collective, a new media and event production company. Gradient Global Collective provides original and curated content and experiences with its sights set on the global community of black women entrepreneurs. Nia Perry is from Brooklyn, New York and went to a fashion business high school. She attended Clark Atlanta for college and has worked in retail, public relations, hospitality in the sales and marketing capacity, and as an entrepreneur. From 1997 to 2005, there was a 265-322% range of growth in black women entrepreneurs in the USA. There has always been a need for representation. There is too much over-played humility—if you don’t think you are the best to ever do it, no one else will. Business sustainability is growing trend for black women entrepreneurs. Gradient Global Collective podcast is the first media product of the company. The founder of the first toilet paper manufacturer founder in Port-au-Prince, Haiti was interviewed on the GGC podcast. Believe your dreams are possible for you. Black women in the United States are the fastest growing group of entrepreneurs. Success is conveyed by how many other people you can assist in reaching their aspirations. – “Gradient Global Collective is a new media platform that spotlights the global community of black women entrepreneurs.” – Nia Perry. – “When you are exposed to it (representation), you know what is possible for yourself.” – Nia Perry. – “The real markers of success are how many people that you can help achieve their goal.” – Nia Perry.